The latest buzz in the employment industry, which has caught the fancy of the job seekers and employers, is the video resume. A relatively new concept, it offers distinct advantages over the conventional paper resumes. The competitive nature of the job market these days requires that your resume should be as creative and unique as possible to catch the attention of your future potential employer. A conventional long three-page formal resume sometimes ends up being at the bottom of the pile unnoticed, while the creative ones get noticed. Unique – Video resumes are unique. They give you an edge over the other applicants as the recruiter will be curious to know more about you and undoubtedly will want to have a look at your resume. 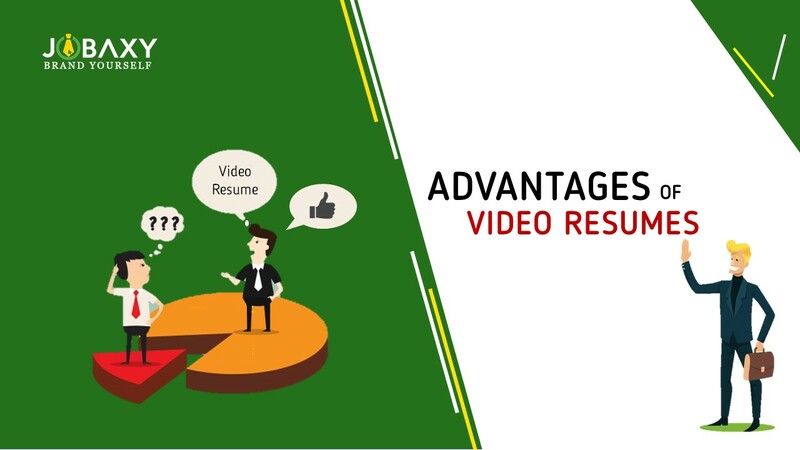 With video resume, you can catch the attention of your future employer and stand out from the crowd very easily. Since it is not a live video, you get the advantage of recording it until you get that perfect shot of yourself. Great First impression - It is said that the first impression is mostly the last impression. Video resume gives you a great chance to present yourself in the way you want and creates a long-lasting first impression. Display facts of Your Personality - Video resumes put a ‘face’ on your resume. Your skills, personality, and talents are visible immediately. The recruiter gets a clear idea of your confidence and your creativity. The employer gets to know what you look like, sound like and act like before the actual interview. It shows your body language and presentation skills. Effectively Sells Your Skills - Video resumes help you to present yourself well before the employer. A video resume gives you the chance to be creative and demonstrate your technical expertise in the exact manner you want. Straightforward and Easy - Creating a video resume is a simple and hassle-free process and talking about yourself is not a difficult task at all. This is the best way you can market and sell yourself and it is FREE. Uploading the resume is also easy for today’s social media generation. Tech Savvy - Video resume reflects that you are a technologically savvy person who has the knowledge of the current trends and adapts quickly accordingly. Want to create your video resume for a bright future? We are there for help. Register with Jobaxy, which is the best job portal in the Philippines and also a video resume website that will help you in securing your future.